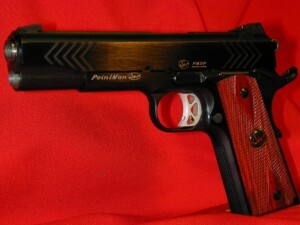 This gun was my personally designed signature pistol that was built by Dan Wesson Firearms (pre-CZ). We started this project in 2001 as DW wanted a custom signature model pistol from a Pro Shooter and Custom Gunsmith so they could add one more trick 1911 to their line of Semi-Auto Firearms. I originally designed the gun as a .45 ACP with a fully supported Clark ramped style DW Match Stainless Steel barrel so in the future customers could order additional pre-fitted interchangeable top ends in 9mm, 38 Super and 10mm. All you needed to do was remove the slide stop and slide on a new top end. I also used one of my favorite chevron front and rear cocking serrations, Novak style front and rear dovetail sights, stainless steel one piece guide rod, McCormick hammer, sear, disconnector and trigger, tactical thumb safety, high beavertail grip safety, checkered front strap and main spring housing, beveled magwell, checkered exotic hardwood grips and forged slide and frame. 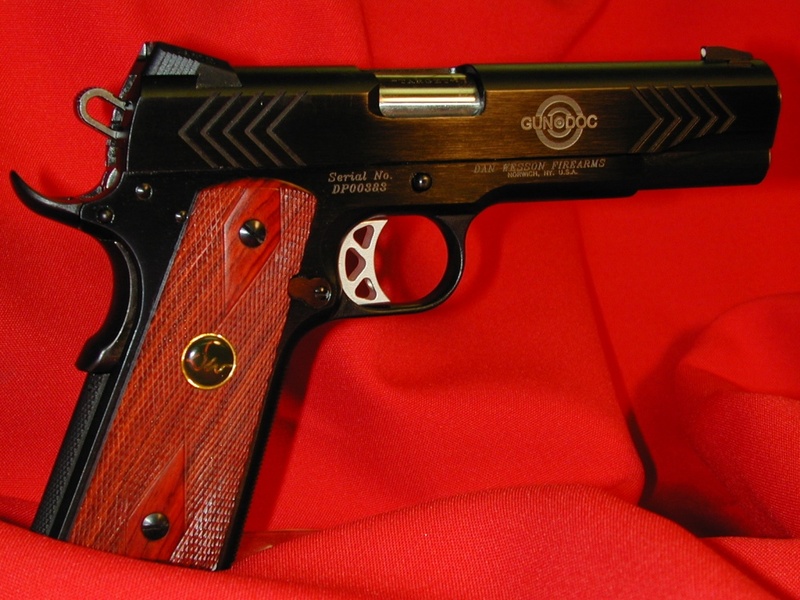 Unfortunately, only 500 or so where made as Dan Wesson was purchased by CZ, so this limited production run was from 2001 to 2005. The serial numbers had my initials and a 5 digit number beginning at DP00100 in them, my company logo Gun Doc and bullseye where also on the right side of the slide. On the left side of the slide was the PMDP name which stood for Point Man Dave Pruitt.